Arnold "Red" Auerbach, who for more than half a century was the combative, competitive, and occasionally abrasive personification of pro basketball's greatest dynasty, the Boston Celtics, died yesterday in the Washington area. He was 89. He died of a heart attack, the Associated Press reported, according to an NBA source who did not want to be identified. In two decades of National Basketball Association coaching, Auerbach won 938 games, a record when he retired in 1966, as well as a record nine NBA championship titles, a number he shares with Phil Jackson. In those 20 years, 16 with the Celtics, Auerbach had only one losing season while winning almost two-thirds of his games. Auerbach was inducted into the Basketball Hall of Fame in 1969 and, 11 years later, was recognized as the greatest coach in NBA history by the Professional Basketball Writers Association of America. That same year, 1980, he was inducted a second time into the Hall of Fame in recognition of his contributions to the game. In 1996, he was honored on the 50th anniversary of the NBA as one of its greatest 10 coaches. His coaching achievement is recognized annually with the awarding of the Red Auerbach Trophy to the league's Coach of the Year. Auerbach himself won the award only once, in 1965. The award was named in his honor in 1967. But Auerbach's genius extended well beyond his coaching. He moved into the Celtics' front office, starting in 1966, and by then already had shown his ability to judge talent with the acquisitions of future Hall of Famers such as Bill Russell, John Havlicek, and Sam Jones through trades or the NBA Draft. Later, as the team's general manager, he would engineer deals for Larry Bird, Kevin McHale, Robert Parish, and Dave Cowens -- all of whom also are in the Hall. Proof of Auerbach's impact on the game as both a coach and talent evaluator is the number of his players who made it to the Hall of Fame (14) and the number of his players who became coaches (30), including eight of the 12 players on his 1962-63 championship team. Three of his players, Tom Heinsohn, Bill Sharman, and Don Nelson, later won Coach of the Year honors. Nelson won it three times. He was also a social force in the NBA, drafting the league's first African-American player in 1950 in Chuck Cooper, hiring the first African-American head coach in pro sports in 1966 in Russell, and having five African-Americans as the Celtics' starting lineup in 1964, an NBA first. He was an international ambassador for the game as well, leading NBA teams on exhibition tours through Europe. "I never thought he'd die," author John Feinstein, who last year collaborated with Auerbach on "Let Me Tell You A Story: A Lifetime In The Game," told the Associated Press. "He was a unique personality, a combination of toughness and great, great caring about people. He cared about people much more than it showed in his public face, and that's why people cared about him." Auerbach was fiercely competitive, sometimes to the point of boorishness. It was Auerbach who would break out a celebratory cigar during Celtics home games -- never on the road -- when it was clear his team had won. He once had a writer's seat moved from the floor to an upper box at Boston Garden because of an unfavorable story. He ordered a complimentary mention of Cedric Maxwell to be excised from one of his books after he felt Maxwell betrayed him. In 1984, Auerbach was invited to coach an old-timers team in the All-Star Game and was ejected for arguing with the officials. In his early years as the commissioner of the NBA, David Stern would joke to friends that he felt his real first name was "Stupid" because of all the conversations he had with Auerbach. Whether it was tennis, racquetball, basketball, knowledge of Chinese cuisine, or simply having the final word, Auerbach was relentless. As former player agent Ron Grinker once said of Auerbach, "Red plays chess. The other general managers play checkers." Auerbach took over as the team's head coach in 1950. He retired from coaching after the 1965-66 season, having won his eighth consecutive NBA title and ninth overall. He served as the team's president and GM for another 14 years and as the president solely from 1984 until 1997, and again from 2001 until his death. He also was the team's vice chairman of the board and still a sought-after adviser well into the 21st century. In his long tenure in Boston, he built three distinct Celtics championship teams: the dominating group that won all but one title in the 1960s, a second team that won two titles in the 1970s, and the last, great Celtics team, which won three championships in the 1980s. The team he took over in 1950 was in last place, but seven years later, he had the first of his nine championships, all anchored by the indomitable Russell. The Celtics won world championships in 1974 and '76 with a nucleus of Auerbach draftees, Havlicek, Cowens, and Jo Jo White, and triumphed in 1981, 1984, and 1986 with the so-called Big Three: Bird, McHale, and Parish, arguably the greatest frontcourt in NBA history. But the magic wore off soon after. At that point, the Celtics had amassed 16 titles in 30 years, never going longer than five years without a championship. They are now approaching two decades since the last championship flag was raised to the rafters. In the 1990s, the Celtics became something they never were when Auerbach was either coaching or involved on a day-to-day basis in the front office: irrelevant. Bird and McHale retired prematurely because of injuries. Reggie Lewis, an Auerbach draft pick and emerging star, died of cardiac arrest. The team had a stretch where it made the playoffs only once in eight years. And when the Celtics briefly made what looked to be a significant move in 1997, the hiring of Rick Pitino as coach, it quickly backfired on Auerbach when Pitino insisted on having Auerbach's long-held title of president. Four years later, Pitino left in disgrace and the team quickly moved to reinstall Auerbach's favorite title (other than coach). Auerbach's record for identifying talent and then acquiring it was remarkable. He convinced two teams in 1956 not to draft Russell, getting one of them (St. Louis) to trade its pick to him for two players, and getting the other to bypass Russell entirely in return for some arena-filling Ice Capades dates. In 1978, five teams passed on drafting Bird, either because Bird would cost too much or would not be available to the NBA for another year because he was still a junior at Indiana State. Auerbach didn't hesitate, and then managed to sign Bird and keep him in Boston throughout his career. Where others saw impediments or obstacles, Auerbach saw opportunity. In 1969, several teams shied away from Jo Jo White because of a supposed military commitment. Auerbach drafted White, who went directly to the NBA and fulfilled his military service in the reserves. In 1981, Danny Ainge, then a professional baseball player, was said to be firm in his decision not to play in the NBA. Auerbach drafted Ainge, now the Celtics' executive director of basketball operations, in the second round and had him in a Boston uniform for 53 games the following season. Auerbach was also the mastermind in what is still considered by many to be the most lopsided trade in NBA history, a deal that brought the Celtics Parish and the chance to draft McHale. The Warriors, who made the deal, ended up with Joe Barry Carroll and Rickey Brown, two NBA journeymen of limited value. His judgment was not unerring, however. Although he developed Bob Cousy into a Hall of Famer, at first Auerbach was adamant that Cousy not be on his team. He bypassed Cousy in the 1950 draft, taking Charlie Share instead. But Cousy ended up in Boston when his team folded and the Celtics drew his name out of a hat. Auerbach was among the first to cultivate the team as family concept, using loyalty as his linchpin. Hall of Famer Bill Walton, who really had only one season playing with Boston, still considers himself a Celtic, first, last, and always. Players occasionally felt the coach's public wrath, but there was always a method to the motive. Agents became a favorite target; he only gradually and reluctantly revised his opinion of them from scum to lowest possible life form. Others, be they referees, judges, opponents, advisers, or even colleagues, would feel his wrath if he detected the Celtics were being scorned or spurned. No one played the us-against-them dynamic more adroitly. He could also be crude, abusive, and hostile. He once sought out Ainge after Ainge played a particularly bad game in Washington. "What, were you out drinking with your other wife?" Auerbach said to Ainge, a Mormon. One longtime acquaintance called Auerbach a terminal juvenile delinquent -- and Auerbach did little to dispel the image. Yet it also, undeniably, was a shtick that he cultivated. "In whatever he did, he wanted to win," said Harry Mangurian, one of many Celtics owners who worked with Auerbach. "There was no letup in him at all." Arnold Jacob Auerbach was born Sept. 20, 1917, the second of four children of Hyman Auerbach, who ran a dry cleaning business in Brooklyn, and Marie Thompson Auerbach. Hyman Auerbach immigrated to the United States from Minsk, Russia, at the age of 12. He took a job working the counter at Rosoff's Restaurant in Manhattan and met Marie Thompson there. They married and opened a delicatessen on Sixth Avenue, across from Radio City Music Hall. In 1931, Hyman Auerbach sold his delicatessen and started a dry cleaning business. Arnold had an older brother, Victor, who succeeded his father in the business. A younger brother, Zang, became a commercial artist and designed the Celtics' leprechaun logo. A younger sister, Florence, was born two days before his eighth birthday. The family lived in the Williamsburg section of Brooklyn, which has produced a raft of NBA talent, from such Auerbach contemporaries as Billy Cunningham, Doug Moe, and Larry Brown to later stars such as Albert and Bernard King and Chris Mullin and Mark Jackson. The Williamsburg section in the 1920s was a true melting pot of both color and creed. Auerbach attended P.S. 122 and then Eastern District High School, where he captained both the basketball and handball teams. His grades were not quite good enough to get a scholarship to New York University, but the basketball coach at Seth Low Junior College, a Brooklyn offshoot of Columbia University, offered him a $100 scholarship. Two years after enrolling at Seth Low, Auerbach moved on to George Washington University in Washington, D.C., after the basketball coach spotted him during a scrimmage and gave him a scholarship. The move to Washington turned out to be a permanent one for Auerbach, who maintained a residence there until his death. Even when he coached the Celtics, his wife and daughters lived in the nation's capital while he stayed at the Lenox Hotel and later in an apartment in the Prudential Center. Auerbach played three seasons for George Washington, averaging 6 points in 56 games. But while there, he established two relationships that would guide him for decades: a love for his wife and a visceral hatred of Madison Square Garden, then the Mecca of college basketball. His wife was Dorothy Lewis, a third-generation Washingtonian and daughter of a local pediatrician. The two were married when Auerbach graduated in 1941 with a Bachelor of Science degree in physical education. He also got a master's in education, leading him one time to chastise a heckler by saying, "I'm not a bum. I'm an educated bum!" The issue with Madison Square Garden came about because the National Invitation Tournament, then the best of the college tournaments, slighted George Washington in Auerbach's first season. He blamed the folks at MSG, where the tournament was played, for the snub, and throughout his pro career he relished wins in that building more than in any other. Auerbach's first two coaching jobs were high school assignments. The first was at an exclusive private school in Washington, St. Albans, and the second was at Roosevelt High School in the city. The second job also included teaching history and hygiene (this was before he became addicted to cigars) and coaching handball. In May 1943, he joined the Navy. Auerbach was spared active duty in World War II, although he became a third-class petty officer. He was assigned to the physical fitness program headed by boxer Gene Tunney and ended up with other sports celebrities such as baseball's Johnny Mize and future California basketball coach Pete Newell at a fitness school in Maryland. From there, he was sent to the Norfolk Naval base to start up an intramural athletic program and had candidates such as Bob Feller, Dominic DiMaggio, Phil Rizzuto, and future NBA coach Red Holzman. After getting the base involved in a number of athletic activities, Auerbach was reassigned to upstate New York and finished out the war at Bethesda Naval Hospital. It was during his stint in the Navy that he started to smoke cigars, a habit he had until his death. After discharge, Auerbach, at 28, entered professional basketball, which would occupy the rest of his life and make him wealthy and famous. A new league was beginning in 1946 that, eventually, became the NBA. One of the franchises was located in Washington, and Auerbach summoned all of his bravado to present himself to the owner as the best candidate for the job. He accepted a one-year deal for $5,000. As the coach of the Washington Caps, he assembled a team from all over, using his military and coaching contacts. One of his signees, a player from the University of North Carolina named Bones McKinney, agreed to terms in the men's room of the Blackstone Hotel. McKinney finished his career with the Celtics and later became a trusted adviser and confidant to Auerbach, responsible for the Celtics' drafting of Hall of Famer Sam Jones in 1957. His first professional team won 49 of 60 games, including 17 straight, a streak that would remain a league record until 1969. The team, however, was eliminated in the playoffs. In his next two years with Washington, he went 28-20 and 38-22, the second year making it to the NBA Finals before losing in six games to the Minneapolis Lakers. But there were rumors of discontent on the team and Auerbach went back to ownership and demanded a three-year contract. When he was offered only one year, he left to accept a profitable job for $7,500 at Duke University as an assistant and adviser to coach Jerry Gerard. This was Auerbach's only flirtation with the college game -- and it was over almost as soon as it began. He felt uneasy about the job, mainly because Gerard was terminally ill with cancer and Auerbach looked like a crepe hanger. Three months after arriving in Durham, N.C., owner Ben Kerner of the Tri-Cities Blackhawks of the NBA called. He had just fired his coach, Roger Potter, after a 1-6 start, and needed a new coach. Auerbach accepted a two-year deal for $17,000. He finished out the 1949-50 season in Tri-Cities, going 28-29. It was the only time he coached a team with a losing record. He then left, furious that Kerner traded one of his starters without his knowledge. Auerbach wasn't out of work for long. The owner of the last-place Celtics, Walter Brown, inquired if Auerbach would coach the team. Brown had come across Auerbach's name after talking to local sportswriters. Auerbach knew Brown's co-owner, Lou Pieri, who had unsuccessfully tried to lure him to Providence to coach the NBA Steamrollers in the mid-1940s. Auerbach demanded a three-year deal. Brown told him it would be a one-year offer because the team's situation was so precarious there might not be a second year. The Celtics had finished 31 games out of first place with a 22-46 record. Auerbach took the one-year offer for $10,000 and began a long, amicable relationship covering 13 years with Brown that always involved a handshake deal. One year, Auerbach estimated it took 70 seconds to agree on a new contract. Auerbach had two new players around which to build -- one of which they got by luck. The team acquired 6-foot-8-inch "Easy" Ed Macauley in the 1950 dispersal draft and a local backcourt whiz from Holy Cross named Bob Cousy. The Celtics could have had Cousy in the draft, but Auerbach was wary of the local pressure to play the popular Cousy and also thought Cousy's unrefined game might not make it in the pros. He opted instead for Bowling Green center Share. Cousy was taken by Tri-Cities and quickly dealt to Chicago. He never played a game for either team because Chicago soon folded. Its three premier players, or presumed to be such, were Cousy, Max Zaslofksy, and Andy Phillip. Their names were put into a hat for the three teams that could afford them or want them: New York, Boston, and Philadelphia. Auerbach wanted Zaslofsky first. Then Phillip. But when the Celtics drew the last name out of the hat, it was Cousy's. They had him for $8,500. The 1950 draft also produced a first: the NBA's first black player. Auerbach chose Chuck Cooper of Duquesne, who played four seasons with the Celtics. Cousy and Macauley started the Celtics on their way. The 1950-51 Celtics went 39-30 and made the playoffs. In 1951, Auerbach acquired shooting guard named Bill Sharman and a bruiser named Bob Brannum from Fort Wayne and the team had success each year. Then, in the summer of 1953, while working at a resort in New York, he got his first glimpse at Wilt Chamberlain, then a gangly high school center from Philadelphia. Auerbach was infatuated with the teenager. He knew he had no chance to get Chamberlain, but it made him realize he needed a big man to complete the Celtics' puzzle. Two years later, while in New York to scout the Holiday Festival, he laid eyes on Russell. Auerbach made a deal with St. Louis to move up in the draft to select Russell, then fended off advances from the Harlem Globetrotters and signed the franchise center, starting a 13-year partnership that would produce 11 world championships. Simply, there is no more successful professional team athlete than Russell. In his college and pro careers, he played in 21 winner-take-all games. His record in those games: 21-0. The Celtics teams of the Russell era were built on defense and running. Russell dominated the boards and blocked shots. Cousy ran the break. Sharman, Heinsohn, Frank Ramsey, and Sam Jones delivered at the other end. Gradually, new pieces were added to the mix. K.C. Jones, drafted in 1956, came aboard in 1958 and Tom Sanders in 1960. In 1962, Auerbach drafted John Havlicek, who had played in Jerry Lucas's shadow at Ohio State University, and then sweated out Havlicek's ill-fated tryout with the Cleveland Browns of the National Football League. As the Celtics continued to win, Auerbach become the embodiment of their success, which, given his legendary arrogance, inevitably led to some clashes. He was never a favorite of the referees and was fined more than $17,000 in his career. Even when he returned in 1974 to coach for one game during an emergency, he couldn't control himself and got ejected. He was suspended for three games in 1951 and got into a fight with Kerner during the 1958 NBA Finals, the only playoff series he lost after Russell arrived. In 1961, three fans in Syracuse invaded the Boston huddle and fists started flying. Auerbach was served with a summons the next day. "I've been accused of being competitive, but [Auerbach had] total and absolute commitment," said Cousy. "He was the most relentless person I've ever met in terms of achieving his goals. He did back then what it takes about eight people to do today. I've never seen such dedication. You can argue about this, but I think he produced the greatest dynasty in the history of sports, certainly in basketball. He knew talent. He knew how to acquire it. He knew how to coach it. He knew how to motivate it. His legacy in terms of sport achievement is unparalleled." The 1965-66 season was his last as coach and the Celtics rewarded him with an eighth straight title, defeating the Lakers in seven games. Auerbach then made the leap and named Russell as player-coach while Auerbach went into the front office as general manager. The first year, the Celtics relinquished their title despite the additions of Wayne Embry and Bailey Howell. But Russell led Boston to championships in the next two seasons -- both upsets -- before retiring unexpectedly in 1969. Auerbach, who had built the team from scratch in 1950, now had to rebuild again. Sam Jones also was leaving. It took five years, but another flag was raised to the Boston Garden rafters in 1974. A year after Russell retired, the Celtics won 34 games under coach Heinsohn and ended up with the fourth pick in the draft. Needing a center, Auerbach had scouted a 6-8 dervish from Florida State named Dave Cowens. The first three teams passed on Cowens, who would anchor the 1974 and 1976 championship teams, win the Most Valuable Player award in 1973, and go on to be named one of the top 50 NBA players of all time in 1996. In 1978, Auerbach pulled another coup, drafting Bird, then a junior eligible at Indiana State. The contract negotiations with Bird's agent, Bob Woolf, were historic both for the contentiousness and the time constraints. Woolf knew his client had extraordinary leverage and tried to milk it for what he could. Auerbach became so exasperated he turned things over to Mangurian and a deal was reached. Bird then proceeded to lead the Celtics to a 31-game turnaround, largest at the time in NBA history. The Celtics won another title, first of the Bird era, in 1981 under Bill Fitch, but by 1983, the team was coming apart. Auerbach named placid K.C. Jones to replace Fitch and then convinced Phoenix to part with guard Dennis Johnson for the no-longer-needed Rick Robey. Johnson gave Boston a stabilizing and defensive presence in the backcourt and the Celtics beat Magic Johnson and the Lakers in a thrilling seven-game series in 1984. Two years later, Auerbach experienced the high and low of his Celtics career. In early June of '86, he again accepted the league championship trophy after the Celtics steamrolled through the league with a 67-15 record and through the postseason at 15-3. It was probably the greatest Celtics team ever. Walton, who had come over the previous summer in a trade for Maxwell, won the Sixth Man Award and was a huge presence on and off the floor. Bird won the third of his three consecutive MVPs. The team went 40-1 at home. But soon after defeating the Houston Rockets for the NBA title, the bottom fell out. The Celtics had the second pick in the draft, courtesy of a deal with Seattle in 1984. Auerbach had his heart set on an athletic, mobile, gifted forward from Maryland named Len Bias. Auerbach had scouted Bias and was good friends with Maryland coach Lefty Driesell. 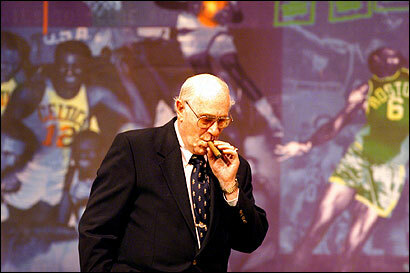 By all accounts, Bias was a can't-miss prospect and Auerbach gloated when he announced the pick. Two days later, Bias was dead of cocaine intoxication. Auerbach cried in the Celtics' office. Even after Auerbach ceded control of the day-to-day operation of the team, his reputation and presence still loomed large, even from afar. In the early 1990s, Dave Gavitt, now the Celtics' senior executive vice president, and another general manager had agreed on a trade. But when the opposing owner was asked to approve, he shook his head and said, "If Red is for it, I want no part of it." Gavitt was forced out in 1994 and former Celtic player M.L. Carr was brought in to run the day-to-day operations. He stayed there long enough to pave the way for Pitino by engineering a 15-67 record in 1996-97, all designed to get the No. 1 pick in the 1997 draft, Tim Duncan. But the Celtics ended up with the third pick (and No. 6) and Pitino never recovered. Auerbach was still consulted, but Pitino was the unquestioned power, as evidenced by his insistence on stripping Auerbach of the club president's title. Pitino left in 2000. Yet another new ownership group came on board in 2002. Ainge was hired in May 2002 to rebuild the team. On the podium that day, Auerbach was asked what he thought about Ainge. "He bleeds green," said Auerbach, who was passed for career wins by Lenny Wilkens in the 1994-95 season. Ainge knew there could be no greater compliment. On Wednesday, Auerbach proudly received the US Navy's Lone Sailor Award in front of family and friends at ceremonies in Washington. Auerbach's wife, Dorothy, died in 2000. He's survived by his two daughters, Nancy Auerbach Collins and Randy Auerbach. He also leaves a granddaughter, Julie Auerbach Flieger, and three great grandchildren.